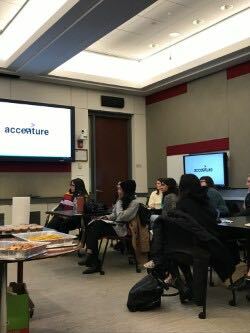 “For our first meeting of 2019, Accenture came and gave students an overview of the company and a better understanding of what the day-to-day looks like in the office. Accenture is a global management consulting firm, providing strategy, consulting, digital technology and operations services. 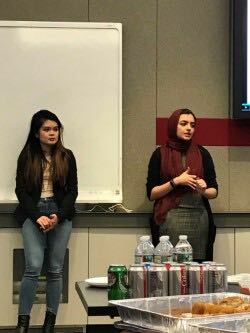 We were delighted to have two BU alumni, Tooba and Kimberly, come and share their knowledge of the company. 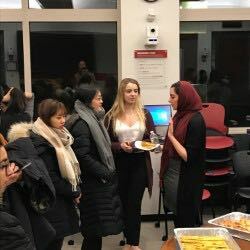 Tooba was an electrical engineering major, who is now a consulting senior analyst; and Kimberly was a statistics major, who now works as a data quality analyst. Our attendees were very interested in learning how our BU alumni were able to get these jobs. Tooba and Kimberly both emphasized the importance of attending recruiting events, as not only will you learn more about the company, but you will also be able to talk to recruiters and see if the company is a good fit for you. 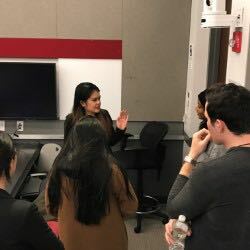 Tooba also mentioned how she visited the career offices and went to the Accenture case prep workshop. If you are interested in applying, there are two stages to the interview process. The first stage is a behavioral interview, and the second stage is both a behavioral and a case interview. Tooba and Kimberly highlighted the importance of the case interview. They recommended reading Victor Cheng’s book, Case Interview Secrets, and practicing with other people. Kimberly said it is crucial to explain how you think and have a clear proposal at the end. At Accenture, every member’s day-to-day is different. Tooba travels every week and has a meeting with clients for two to three hours each day. Kimberly works on virtual projects from home every day. Another interesting aspect of working at Accenture is that other than the first project that is assigned to you, the rest of the projects are all found through networking or the internal application. For More awesome events like these, head to the herNetwork.